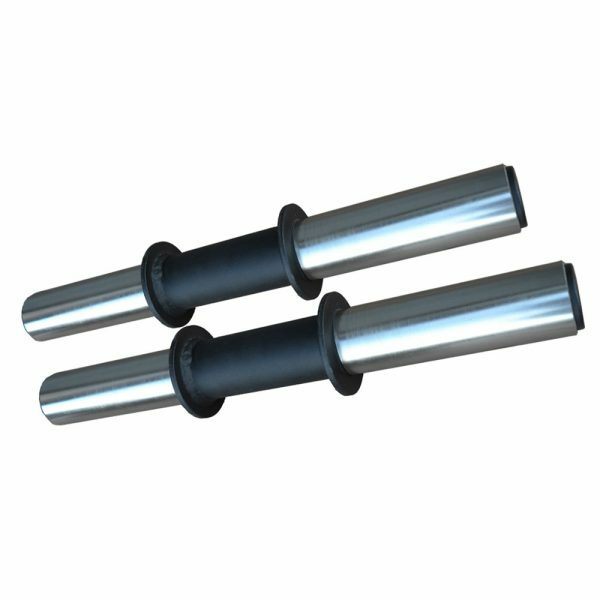 These are incredibly heavy duty, solid steel, 18″ long dumbbell handles with 38 mm knurled grips. 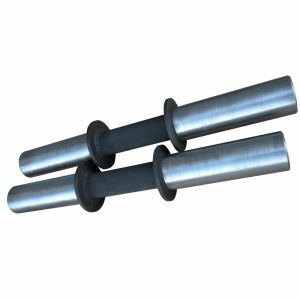 If you’ve ever experienced the thin 25 mm handles on most dumbbells ‘cutting’ into your hands when using a lot of weight you will love these. The 38 mm knurled handles feel totally solid and incredibly comfortable. Weighing 7 kg each unloaded. Solid 50 mm ends take any olympic plates and collars. These are brilliant! They’re very heavy and have a great finish. 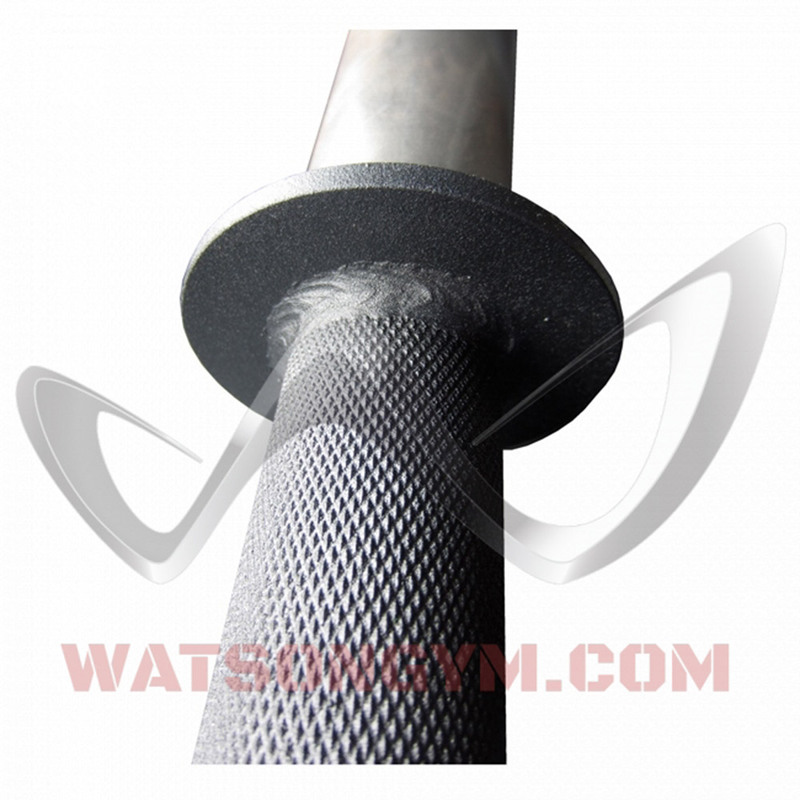 They feel very safe to use as well due to the grip width and the knurling. Lovely quality all round. Would highly recommend these to anyone. 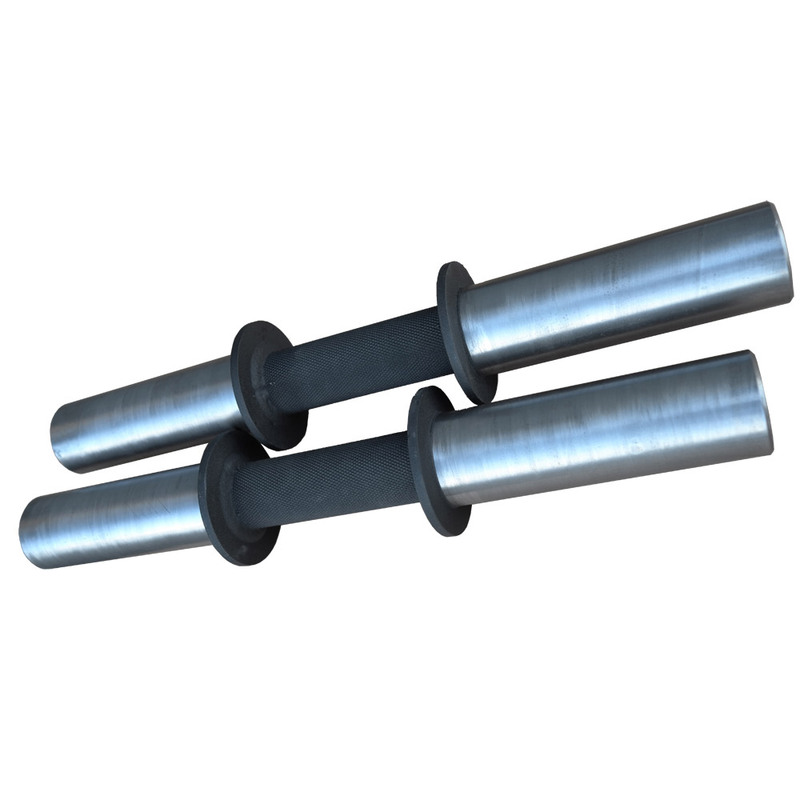 I like barbells – a decent bar is solid, well-knurled and, well, feels trustworthy (something I find important when you’re under load…). Dumbbells, however, in my experience feel the opposite to this and I have not used them in my training as much as would be beneficial because the experience has always been so meh… until now, that is. Just unpacking these bad boys you can see they ooze quality. But then you stack some weight on them and they are amazing. The grip’s fantastic, probably down to a combination of the grip width and excellent knurling. I’ve had enough time now to do some quality pressing and pulling with them and I like them so much that I’ll be buying bars from Watson in the future, too. Also, nice to see that British industry can still turn out products that should rightfully be the envy of the world. 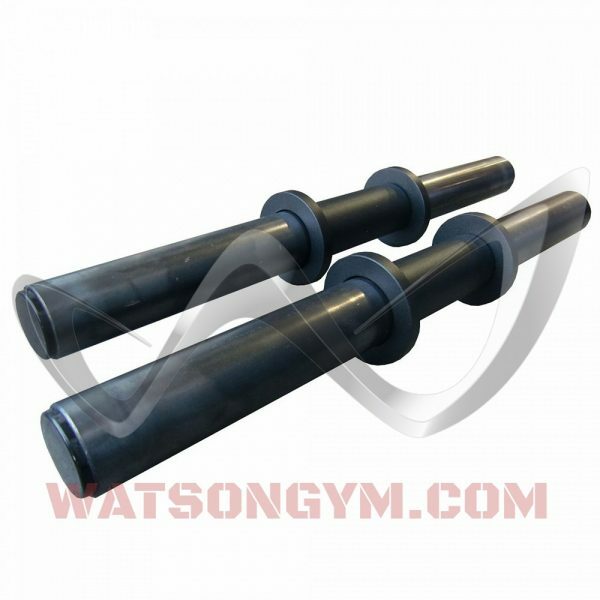 Extremely heavy duty and high quality dumbell handles from Watson, certainly deserving of the ‘Animal’ title. Will definitely take more weight than anyone could possibly hope to lift with one hand! I have had mine for a number of months and they are used several times a week, with not a mark on the powder coat as yet. I completely agree with the earlier reviews relating to the bomb-proof knurling, which is deep but comfortable and confers a great sense of confidence in the level of grip afforded, particularly with heavier loads. A genuinely excellent product. Just wanted to say that these are incredible quality. The grip is superb, the finishing stunning. I would fully recommend these to home and commercial gyms alike. This is my favourite Watson product in the 10 odd years I have been buying from them. I went for just the 1 handle, to train the 1 arm clean and press (also great for 1 arm rows). I have owned and used thin handled dumbbells in the past and never liked them. This 38mm grip is fantastic. It is thicker than normal, providing a solid connection with your hand, without being so thick that it becomes more of a grip exercise, like 2″+ handles can. The whole thing is one solid piece and the fact it weighs 7 kgs on its own already saves you some space for more plates. I’m not afraid of the lovely deep knurling either, digs right into your hand. I love this dumbbell handle so much I even bought it eight 5kg Leoko discs to wear! I also purchased the slim line collars along with it. The fact you tighten the bolts onto the shaft means they won’t ever be going near my Ivanko barbell, but on these dumbbell handles they are great. Bulkier collars just take up valuable space for plates. I would highly recommend these handles to anybody. They are without doubt the absolute best I have ever come across. Being frustrated by the lack of available space or equipment in gyms in conventional gyms and with no well-fitted gyms in the local area, I decided to purchase these fantastic handles. Adaptability in the home gym is really necessary so being able to swap plates around with ease on a solid handle was the main factor in this purchase. The quality is immense, the knurled handles provide solid grip under weight, the lockjaw collars enable to the disc to move independently of the handle, making for a comfortable rep. Switching plates is easy with worn and clumsy hands / arms thanks to the lock jaw collar. Unpacking the handles from what I can only describe as the best box I have ever seen was pure joy. The freshly drawn steel makes me nostalgic of the my time spent doing metal work. I am very satisfied with purchase and glad I found watson gym equipment before purchasing the horrific alternatives on the market.